PHILIPSBURG — There are conflicting reports coming from the Ministry of Finance regarding the issuing of the vehicle number plates and the stickers. 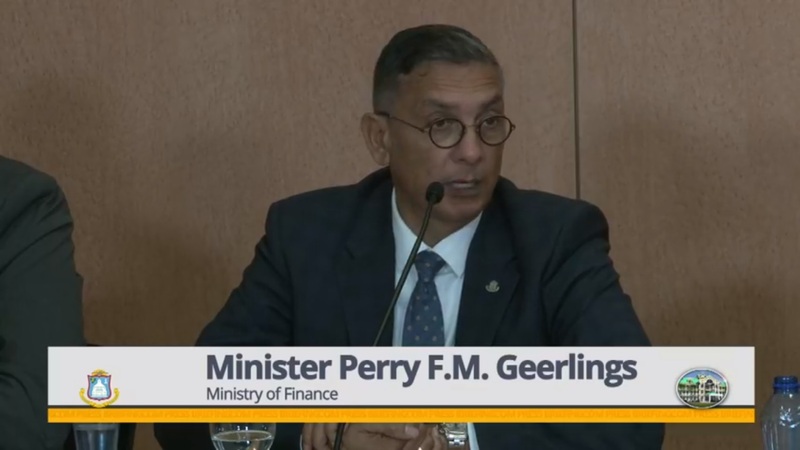 The Minister of Finance Perry Geerlings in response to questions about the issue stated that motorists should be aware that the legal object for vehicles are the number plates. He indicated that the displaying of the number plates is proof that persons have paid their road taxes which is a requirement by law. He noted that because of the controversy regarding the use of the number plates persons could use the stickers on their vehicles but must have the number plates at hand in case they are confronted by the police. The Finance Minister was further pressed about the issue with regard to the law on the stickers and the number plates and was asked about the law. He responded that the legal department is presently working on an amendment to the law. He said that it was an unfortunate situation that arose and the Council of Ministers is trying to appease sections of the community who do not want to use the number plates on their vehicles because it speaks of the 50th year of carnival on the island. He noted that this move by government is a clear indication that the present government is sensitive to the concerns of the society and try to serve the people of St. Maarten. He acknowledges that the “law is the law” and if persons have an objection to using the number plates they could display the sticker but they must have the number plates in their possession. Recently at a Council of Ministers press conference it was stated that motorists could have either the sticker or the number plate. Now it is different, the Finance Minister indicated that a person could have both sticker and number plate on their vehicles as they see fit.